WHAT’S THE TRUTH BEHIND HISTORICAL FICTION? I interviewed novelist Ali Bacon about writing ‘creative history’ and her use of a male protagonist when writing for a women’s press. 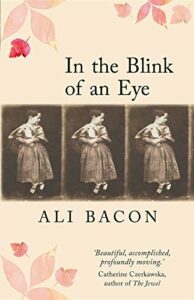 Ali’s third book, In the Blink of an Eye, is a ‘fictionalised biography’, aka ‘faction’, or ‘docudrama’, written about the Scottish Victorian photographer David Octavius Hill. Ali tells his story mostly through the eyes and voices of a number of women who have been largely overlooked by history. Ali Bacon’s story The Bird of Wax, which forms Chapter 4 of In the Blink of an Eye, won the 2017 Evesham Festival of Words Adult Short Story Competition. I began by asking Ali about her personal story, and how that led to writing historical fiction. Leslie: Can you give a brief overview, please, of your writing career so far. Ali: I think of my ‘career’ as beginning in 2003 when I joined a class called ‘write a novel in a year’. I didn’t quite manage that but I did have an idea for a novel which I eventually completed around 5 years later (speed is not my thing!) I also wrote occasional short stories and had a few short or long-listings in competitions. My second novel A Kettle of Fish (a coming of age novel) was published as an e-book and I self-published the paperback version. It was in the course of writing Kettle that the idea for In the Blink of an Eye came along, an unexpected switch into historical fiction. Blink took me just as long to write and along the way I embraced the short story form more whole-heartedly and took to entering ‘livelit’ events and performing my work on the (small) stage. I find this a great antidote to the long haul of writing a novel, where there is very limited short-term gratification! Leslie: What stands out from your Scottish upbringing? Ali: After the death of my parents in the 90s I didn’t feel much connection with my Scottish roots (an only sister had also moved down south) but following a holiday in, 2007, I felt a definite need to reconnect and went on to write A Kettle of Fish which celebrates many places which defined my childhood: the Dunfermline public library (the first of its kind), the view from Fife towards Edinburgh (the big city!) and the tiny seaside village of Largo where I spent many several summer holidays. 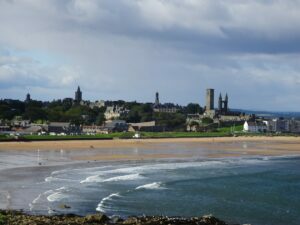 I went to university in St Andrews – just along the coast – which was a factor in my choice of the Hill and Adamson story (Robert Adamson was from St Andrews) and visiting there recently I have appreciated that town’s many histories and how they interleave with my own: as a student, a writer and even a golfer! The other things which stand out now from my childhood are the influence of our extended family, the central role of the church, or ‘kirk’, in our lives. I’m no longer a church-goer but I’m aware how it provided a community other than family and school. One of my few forays into memoir is a reflection on the fact that my own church burned down soon after our marriage and was never rebuilt. The other thing I reflect on is how although we never considered ourselves ‘poor’ how much was defined by money, or lack of it. 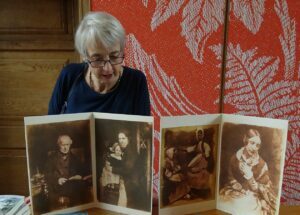 Leslie: ‘In The Blink of an Eye’, published by a women’s press, follows the life of a man, David Octavius Hill. How did you cover the experience of late Victorian women through a male protagonist? What other aspects of social history were you aiming to cover – and how did you do it? Ali: What fascinated me about DO Hill’s story was the number of women he seemed to attract or influence and I wanted it to be their story. The problem was in choosing which one to carry the thrust of the narrative. In the end I divided it between several women (and two men) some with bigger and others with smaller roles. This multi-faceted approach may have thrown more emphasis onto Hill himself but I don’t think it detracts from the women’s story. It was a matter of more surprise when I ended up giving the prologue and epilogue to a man, which did fly in the face of my original intention, but it felt absolutely right for the structure of the story I had made. Leslie: What were the stand-out experiences for you in researching your historical novel? What have you learned from that task? Ali: I carried out research over a long period with lots of changes of direction. 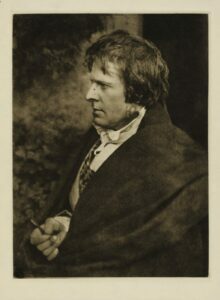 I needed to understand photography – which didn’t come easily – and I had very little knowledge of Victorian Scotland. Two things probably stand out – a article about Hill and Adamson’s assistant Jessie Mann, an ‘ordinary woman’ who embraced and helped develop a new scientific technique. For a long time I intended her to be my sole protagonist. The other major turning point wasn’t a discovery but an event. At the St Andrews Photography Festival of 2016 I met a whole community of people who regarded Hill and Adamson with the same affection as I did myself. I made friends and gained access to technical expertise, but the biggest change was the feeling of being part of a community rather than a lone traveller. It motivated my to finish the book which had been in the doldrums for quite a while and probably taught me that connecting with people is as important as reading for hours on end! Leslie: Your book is classified as non-fiction but presents as a novel. How would you describe the book’s classification and approach to its subject? Ali: This one is quite tricky. I wrote it as a ‘fictionalised version’ of what I knew or thought might have happened. I guess this is very close to narrative or creative non-fiction and at times I wondered if I was straying into this. However there are many non-fiction accounts of D. O. Hill, from the scholarly treatise of Sara Stevenson to the more popular (populist?) Mr Hill’s Big Picture by John Fowler. I always knew Blink was different again and I personally wouldn’t classify it as non-fiction. It’s my attempt to tell the story for the reader of fiction – people who like me were unlikely to pick up any of the non-fiction accounts. I think its proper category might be fictionalised biography (of which I’ve read many examples, both good and bad!). In tele-visual terms it’s faction, or docudrama which I think are more useful, though not very beautiful, terms for something praised for the elegance of the writing. Leslie: Which writers are particularly important to you – why them? Ali: I’m not sure there is one writer who has stayed with me throughout my life, unless some of my favourite children’s writers like Enid Blyton and Elinor M Brent-Dyer, and also classic writers like Dickens or R L Stevenson whom I knew mainly through BBC classic serials! I’ve had many favourite contemporary novelists ( Margaret Drabble, Penelope Lively) who were big influences for a while but whom I’ve returned to only to discover the allure has worn off. Now that I read with a more writerly eye, I’m impressed by anything with a distinctive voice, including memoir. I’m also a great fan of Robert Harris and his unique talent to inform and entertain at the same time. Leslie: How did you approach the task of writing a character-driven story with so much factual material to ‘get through’? Ali: The other thing I learned from research is that it mustn’t stifle the story. When I came to rewrite Blink in 2016/17, I didn’t just throw away my first draft but also turned my back on all of my research references and simply wrote what I felt to be true. This did entail a lot of checking and a few changes in the final version, but generally it made me focus on the story rather than the facts, whatever they might have been. Leslie: Should historical fiction stick closely to verifiable historical fact, or be free to imagine the fictional ‘feel’ of events and characters? 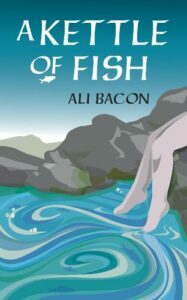 Ali: History, in terms of facts, is a slippery fish. Every age interprets the past in a new light and even writers of factual books will select and refocus on what they have found. Many historical writers deal with only fictional characters, which makes the task easier, I imagine, but I don’t think many writers would fly in the face of known facts unless for some very particular reason which they will probably explain in notes for any reader who is interested. Readers are also aware that fiction is fiction; regardless of research authors can convey only the impression of authenticity. Anyone who wants to follow up a good historical novel and uncover what did or didn’t happen can do so and make their own judgements. I admit I erased a few people from my story who might have cluttered it up (!) One day maybe someone else will tell their story. 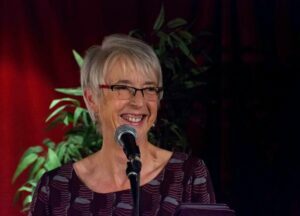 Next week I interview ‘The Emergency Poet’ Deborah Alma about how she brings poetry to people, taking as her model a doctor’s consultation. A fabulous post. Thanks for all the information about the novel and about the process of writing it. Thanks Ali and Leslie. All the best. A very interesting article. I am finishing editing my second historical fictionalised novel and I understand exactly what you are saying here. Thanks for sharing your thoughts, Alison. Good to know about your books too.